The aim of work package 9 was to explore adaptive and self-learning neural network-based control systems for generic wave energy converters and contrast performance over a range of changing sea states. This work package has investigated the efficacy of adaptive control techniques for improving the mean power captured by an oscillating wave energy converter in a range of irregular seas. Different means for controlling the response of the device have been developed and their performance compared over a wide range of sea-states. The power capture performance of each technique has been simulated for the standard case of a heaving buoy using a newly developed SIMULINKTM model, wherein hydrodynamic interactions are modelled using the time-domain model developed in WP2. The control techniques are both passive and active and have been developed for increased power capture. Passive methods can be considered as 'slow-tuning' techniques and differ in terms of how the 'dominant' wave frequency is defined. Two of the active tuning methods aim to maintain quasi-resonance by matching the natural frequency of the device to some measure of the incident wave frequency: both the frequency of the wave-groups and incident wave frequency are considered. These techniques differ in that the group-frequency approach requires future wave prediction, whereas the incident wave model does not. The third active tuning technique is designed to minimise the difference between the period of device velocity and incident wave velocity, by time-variation of the mechanical properties of the device. Uniquely, this approach requires no future wave knowledge or prediction of device response, yet provides an increase of mean power capture. Results show that, relative to a device tuned to the energy frequency of a wave spectrum, the three active control techniques investigated provide a significant increase of power capture in a wide range of sea-states. This work has identified that the persistence of the radiation force acting on wave energy converters is not adequately modelled in the frequency domain. The resulting control problem is non-causal, especially for large devices with long radiation impulse responses that will experience broad bandwidth seas. In collaboration with Ecole Centrale de Nantes, this work package has attempted to predict parameters and timing data for the next wave, for use with latching control. It has generated a large set of training data describing the waves, developed feature extraction techniques, and trained three different prediction methods - one of which is entirely new. 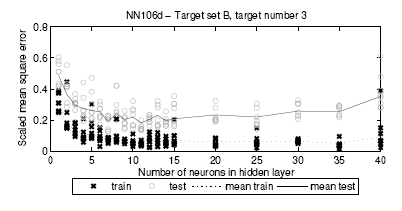 Results have shown that MultiLayer Perceptron neural networks can be trained to provide the information that is required by a control system better than frequency estimation techniques for broad-bandwidth waves. This is significant because the standard control concepts currently being adopted are based on frequency estimation, and most of these devices are large enough to have long natural periods and thus will benefit from knowledge of future waves. New adaptive control techniques have demonstrated the capability to increase the energy capture from a heaving wave device. Neural-network predictors have been developed to forecast next-wave data for the next generation of control systems.